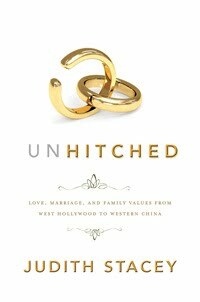 While my children read numerous required books over the summer, I was fortunate enough to read Judith Stacey's new book, Unhitched: Love, Marriage, and Family Values from West Hollywood to Western China (NYU Press, 2011). Judith (left), who is a Professor of Social and Cultural Analysis and Sociology at New York University, spent more than a decade interviewing and observing different types of families in California, South Africa, and China. This book compellingly (and wittily) draws together her ethnographic analysis of the various types of families with which she spent time: gay men in California, polygynous families in South Africa, and the matrilineal, matrilocal Mosuo families in China. In questioning unitary definitions of the family and marriage, Stacey uses these diverse family forms to illuminate contemporary cultural clashes over the future of the family. Covering issues arising from the 1965 Moynihan Report to President Obama’s support for marriage-promotion, Stacey urges skepticism not only about the conventional marriage model of one man for one woman but also about popular notions concerning the family and sexuality held by conservatives and feminists.